Whether you’re running the mile, 2 mile, or 10,000-meters, you’ll greatly benefit at your meets with a long distance track spike. 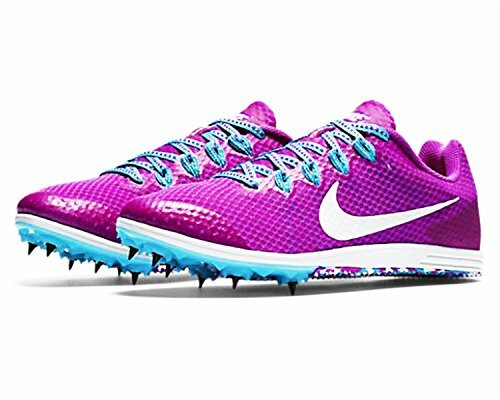 These kinds of spikes have more cushion than you’ll find on a sprinting spike, but less than a cross-country spike. Although traction is less important on a track, you’ll still need good grip to motor around the turns. Entry level long distance spike are flatter and have more cushion underneath – they’ll feel more like your trainer than an elite-level spike. 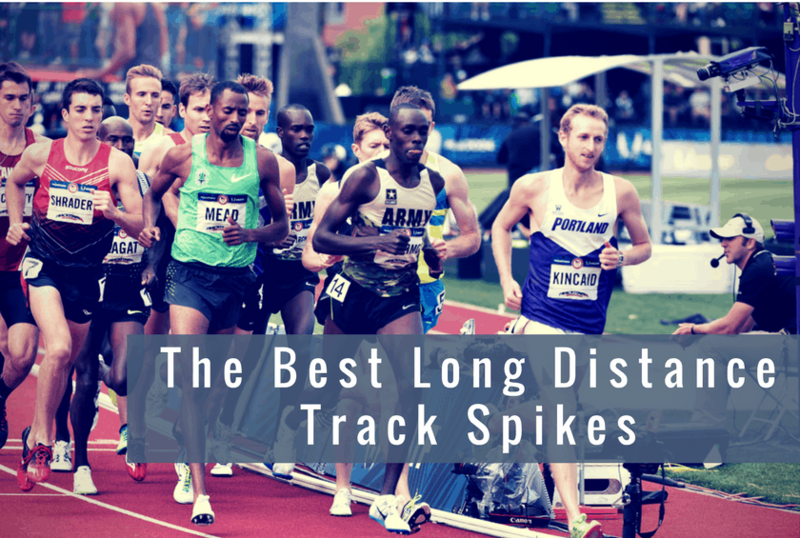 You’ll also find that a long distance spike won’t put you up on your toes the way a sprinting spike or mid-distance spike will. That said, your shoe is an extremely personal choice, and each runner has to take personal preference, competition level, and event conditions into consideration. Below are six excellent choices for long distance events. The Saucony Endorphin 2 is one of the lightest track shoes out there, weighing in at just 2.8oz! That’s truly incredible but as always, you give up some things to maintain that kind of weight. 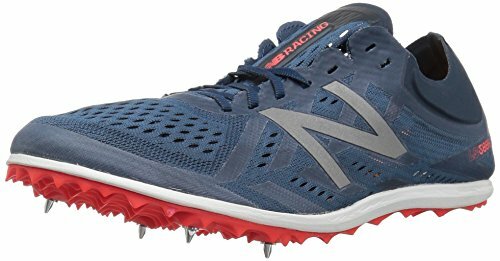 This shoe comes with only four spike pins (normal, since we’re talking longer track distances here) and has a small amount of texture on the lateral side of the heel. The flexfilm upper is part of what allows this shoe to be so lightweight. It also makes it extremely breathable, to the point that you can even see your skin through the shoe. It is minimally comfortable, with a soft ankle collar, thin molded foam footbed, and EVERUN technology in the forefoot to absorb shock to allow you to run further and faster. If you’re a competitive runner and you’ve found in the past that you don’t do well unless you’ve got a lot of padding, you’re not going to like this shoe. If, however, you value a barely-there feel and an aggressive stance, you’ll love the Saucony Endorphin 2. The Vazee Verge from New Balance might not be our lightest spike listed today, but it’s certainly the most aggressive in terms of support, traction, and spike configuration. If you suspect the elements might be inclement on race day or you’re looking for a shoe that values support over weight, this is your pick. Because of this shoe’s whopping eight spike wells, you’ll probably find it works best for the mile or two mile than longer long distance runs, simply because it has a more aggressive toe, which means your feet could grow tired by the end of the race. This all depends on personal preference and race style. Whatever your preference, you’ll appreciate the no-sew construction of the Fantom Fit upper, as no seams mean fewer places to potentially rub your feet raw. The fifth iteration of the 5000 long distance spike from New Balance boasts updated tongue construction and a solid trade-off between strength and weight to make an excellent midweight spike for long distance runs. This shoe includes a Fantom Fit upper that is composed of mesh and synthetic materials, plus a no-sew construction that won’t irritate your foot. The honeycomb outsole provides flexible yet strong support, a boon to the shoe as it only has four pins. Those who favor a barefoot-friendly fit will appreciate this shoe since it also comes with a supple midfoot wrap to help you feel supported without the extra weight of foam insoles and arch support. 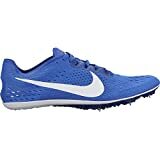 While you might not get as much traction as a six or seven spike shoe, you’ll still appreciate the stickiness of this shoe as you round each turn on the track. If you’re just starting with long distance events, you’ll find the Nike Zoom Rival D 9 is a great option. What separates beginner shoes from the more elite shoes tends to be cushioning. New athletes tend to need more support and prefer comfort. While highly competitive runners have battle worn feet that can handle the trade-off that comes with less comfort but less weight. That’s not to say that the Rival doesn’t perform. Its comfort is enhanced with a Phylon cushioning and single-layer mesh, both of which are extremely lightweight. The Pebax plate from toe to heel adds strength and the six removable spikes make this a tacky option–in the best way! At just under 5 ounces, this is a solidly midweight shoe, and manages to be so while also protecting your arch; Flywire tech and a molded medial arch both make sure you won’t suffer in your midfoot. The Nike Zoom Victory is an impressive shoe designed for elite athletes. How elite? Well, this was the shoe of choice for the 2016 summer Olympics in Rio! 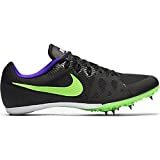 Weighing in at just over four ounces, this spike is lightweight yet comfortable thanks to some high-level tech from Nike, one of the track spike leaders in this market. The spike plate on this shoe’s forefoot has an innovate combination of stiff and flexible zones so that runners get the optimal mix of power and flexibility, great for the kind of movement long distance runs demand. The anatomical toe shape means you have a barefoot style of running that doesn’t hamper your entire foot movement, plus the hole in the heel allow the shoe to shave a tiny bit of extra weight and still manage to conform expertly to your body. The Victory has six detachable spikes for excellent traction on the track, as well as a sharkskin heel pad for extra grip. Featuring the trademark boost energy-returning properties, the Adidas adiZero Avanti charges every step with endless energy. 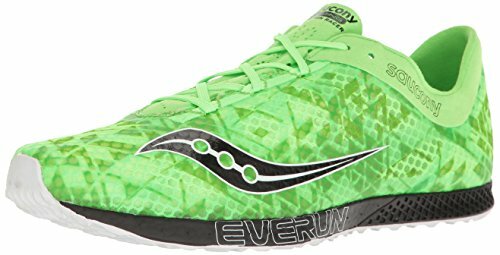 Recommended for a variety of cross county events, you’ll see that this shoe is perfect for 800m, 1500m, 1 and 2 mile, steeple, 5k, and 10k races. The sleek micro-suede lining is perfect for delivering added durability in the high-tension areas of the foot. Additionally, the glove-like fit of the air mesh upper provides maximum breathability for increased performance. Measuring true-to-size with a narrow heel width and low toe box height, the Avanti is ready to take you to the finish line of your next track race. The full shoe plate propels you forward for high-performance racing, while the perfect four-pin spike placement lends itself to a better track grip and added speed. With the lightweight and driving speed of the Adidas adiZero Avanti, you’ll have no trouble leading the pack. This cross-country spike is engineered for maximum comfort and responsiveness while increasing durability.